EQUIOS Online | SCREEN Graphic Solutions Co., Ltd. Web portal system builds trust between production companies and clientsEQUIOS Online is an Internet-based communication tool that seamlessly connects the customer, designer and prepress processes. Revision instructions and progress updates can be shared online by all parties, allowing the creation of a highly efficient, error- and loss-free workflow. Linking with EQUIOS as its front-end software, EQUIOS Online helps to optimize the entire production process. It also supports the provision of new value added services for discerning clients. Advanced linking with EQUIOSNew jobs can easily be created and registered from EQUIOS Online, without using EQUIOS itself. This helps to create a flexible workflow even in environments where process management and prepress operations are separated. 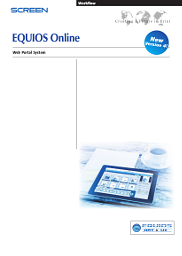 EQUIOS Online allows instructions to be issued, making it possible to increase or decrease pages and insert pages of different sizes. And restored job data can also be displayed in EQUIOS Online as the initial proof for a new job. This greatly simplifies the flow of operations when reproducing plates or replacing individual sections. Greater customer satisfactionThe login screen for EQUIOS Online can be personalized for individual clients. This allows the layout to be arranged to accommodate specific client requests, helping to prevent data management and operational problems or errors. Two CPUs are recommended when also using the EyeMineEQ Online plate inspection option. Can not be used in combination with EQUIOS Inspection.